It is well-known that RS-NO can act as NO donors in the presence of spurious metal ions. The phenomenon is usually attributed to redox activity of the metal ions. As discussed above, this viewpoint is valid for copper, but does not apply to iron. Experimental data, in particular EPR, showed that RS-NO in the presence of ferrous iron forms a quantity of DNIC rather than release NO. Instead, free NO is released upon the disintegration of DNIC according to the equilibrium of Scheme 5. The preceding in-vitro data showed that DNIC is a crucial transient agent in the iron-catalyzed release of NO from RS-NO. We hypothize that the same situation applies to biological systems. Phrased otherwise, under the action of spurious iron, the true NO donor might not be RS-NO itself, but the RS-DNIC intermediate that is formed from RS-NO under the action of ferrous iron. Experimental support for this hypothesis will be given in this section. were further increased, the specific sGC activity is even reduced, supposedly due to enzyme redox deactivation by NO and oxygen . However, the dose-response dependence for both NO donors changed sharply when enzyme preparations were treated with GS-DNIC or GS-NO, 3-4 min after supplementation of the potent iron chelator bathophenatrolin disulfonate (BPDS, 10-4 M). At this condition, the optimal enzyme activation was achieved at concentration of GS-DNIC = 10-8 M (Fig. 20). This value was around two orders of magnitude smaller than that observed in enzyme preparation without BPDS. For GS-NO, BPDS addition had an opposite effect: optimal enzymatic activity was achieved at concentration of GS-NO = 10-4 M (Fig. 20), that was two orders of magnitude higher than that found in the absence of BPDS. These changes can be explained by the following way. The iron chelator BPDS extracted iron from the DNIC complex, thereby destroying latter and releasing the NO ligands. This rapid forced NO release made enzyme activation by much lower DNIC concentration. As to BPDS effect on GS-NO activity, it can be rationalized by the capacity of ferrous iron from admixture to transform GS-NO to DNIC. BPDS could suppress the intrinsic iron-mediated destruction of GS-NO. 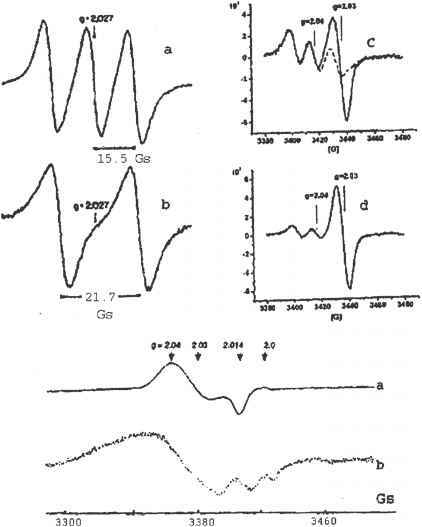 The chelation of iron clearly prevented the formation of DNIC and increased the activation threshold of sGC by GS-NO by massive two orders of magnitude. Clearly GS-DNIC is a much better activator of sGC than GS-NO. We also note that the presence of some free iron greatly enhances the potency of GS-NO to activate sGC. In principle, intrinsic copper could also contribute to NO release from RS-NO according to Scheme 1. However, the data reported in [17,18] demonstrated that BPDS did not inhibit the activation of sGC by RS-NO. Taken together, these data indicate that GS-NO activates sGC via a sequence of successive steps. The first step involves the formation of intermediate GS-DNIC according to Scheme 7. In the second step, GS-DNIC acts as the true activator of the enzyme. Other examples can be given where GS-NO, RS-NOs and low-molecular DNIC induce similar "NO-like" responses. It is striking to note that DNIC always appears to be far more effective, with responses triggered at DNIC concentrations of orders of magnitude lower than with GS-NO. sGC is not the only enzyme to have such sensitivity to DNIC. A similar situation was noted for the enzymatic inhibition of brain and kidney Na/K-ATPase when comparing GS-NO with Cys-DNIC and GS-DNIC . Inhibition of this enzyme activity by both types of nitroso compounds was accompanied by a decrease in amount of free thiol groups on the protein and changed its sensitivity to the substrate concentration. Incubation with 100 ^M GS-NO suppressed activity of Na/K-ATPase by 12%, whereas 50 ^M GS-DNIC or Cys-DNIC inhibited by 45 or 70%, respectively. The low effectiveness of GS-NO shows that it does not get transformed into DNIC to any significant measure, presumably because the level of spurious iron was too small (1-2 ^M). This changed drastically when exogenous iron was added: The inhibitory activity of the GS-NO preparations sharply increased when 50 ^M ferrous-citrate was added to the solution. The effect cannot be attributed to some iron-catalyzed release of free NO, as the latter is a poor S-nitrosator. We attribute the effect to the formation of a significant quantity of DNIC. The formation of DNIC in these solutions was confirmed with EPR . The key role of non-heme iron in RS-NO function as a NO donor was demonstrated in the paper with the characteristic title: "Cellular non-heme iron content is a determinant of nitric oxide-mediated apoptosis, necrosis, and caspase inhibition" . This paper compares the apoptotic response of RAW264.7 macrophage cell line with low endogenuos non-heme iron, and hepatocytes with high endogenous non-heme iron. The apoptotic stimulus is given with NO donor S-nitroso-acetyl-DL-penicillamine (SNAP). The hepatocytes have much higher resistance to the apoptotic stimulus by SNAP. Preincubation of the RAW264.7 cells with exogenous iron reinforced their resistance to apoptosis by SNAP. The resistance could be raised to the hepatocyte level by reinforcing iron. Concomitant with apoptotic resistance, high iron status led to the formation of DNIC in both cell lines. The authors attribute the formation of DNIC to the scavenging of free NO released by SNAP. This interpretation sits uneasily with our conclusion that DNIC formation is dominated by the direct reaction of iron with nitrosothiols. Therefore, we propose that the decomposition of SNAP degradation depends on the level of non-heme iron: In macrophages with low non-heme iron, SNAP could release free NO under catalytic activity of copper and the free NO triggered the apoptotic chain. The apoptotic chain was not triggered in hepatocytes and iron loaded macrophages. It suggests that the NO levels on these cells remain low throughout the experiment. In these cells, a prominent quantity of DNIC could be formed by the equilibrium reactions between non-heme iron and the nitrosothiol (SNAP or GS-NO), without the involvement of free NO. Other studies of apoptotic processes in cultured cells have provided further support for the significance of the reaction equilibria between S-nitrosothiols, iron and DNIC. NO, GS-NO or SNAP-mediated apoptosis are well-established models in various tumor cultured cells. It has been often reported that the activation of the apoptotic chain by NO donors could be inhibited by coadministration of iron [38,39]. Closely related, exogenous iron also reversed NO- or SNAP-mediated inhibition of cell growth and caspase activation. The authors have interpreted the effects of iron without considering the possibility that DNIC might be involved. However, it is highly likely that significant quantities of DNIC were formed in these cell cultures. After all, DNIC formation is routinely observed with EPR in cultured cells after exposure to RS-NO or other NO donors [31,37,40-42]. Nitric oxide is known to stimulate the expression of the soxRS- or SOS regulons in Escherichia coli. Alternatively, the expression may be stimulated by exposure to NO donors or GS-NO [41,43]. The main functions of these regulons are to protect bacteria against oxidative stress or to provide DNA repair, respectively. EPR spectroscopy confirmed that the exposure to NO or GS-NO induced the formation of intracellular protein-bound DNIC. In all cases, prior addition of strong iron chelator, o-phenanthroline to cell suspension blocked completely both the formation of DNIC in cells and the expression of the soxRS- and SOS-regulons. Interestingly, regulon expressions were also activated if the bacteria were exposed to an extracellular dose of Cys-DNIC or GS-DNIC. The activity was also inhibited by o-phenanthroline. It confirms the crucial role of iron in expression of these genes as induced by DNIC, GS-NO or free NO also. Given the reaction equilibria of Scheme 11, it seems conceivable that many physiological effects of NO or GS-NO are potentiated by the formation of endogenous DNIC from intracellular spurious iron. Thus, the data presented above emphasize that NO, RS-NO and DNIC cannot be considered separately from each other. Instead, the pools of these compounds are coupled via the pool of spurious iron. The reaction equilibria were investigated in-vitro studies, but a multitude of experiments in cultured cells, tissue extracts and live animals suggests that the same equilibria be significant in vivo as well. Moreover, it is not to be excluded that RS-NO function via a mechanism involving the transformation of RS-NOs into DNICs as a NO and NO+ donors. However, the interest to the DNICs is low up to now. Most of the investigators consider the RS-NOs as a most important endogenous nitroso compounds which determine the NO function in cells and tissues. Moreover, it is suggested that the RS-NOs can ensure the basis for designing of the medicines using NO biological activity. Endowing the DNICs by this role seems to be disputable. There is an opinion that iron releasing from DNICs can initiate the formation of hydroxyl radicals via the Fenton reaction. Really, that is a serious argument against using the DNICs as a new type of the medicines. So, the intensive investigations are needed to test the proposed adverse action of DNICs on the organisms. A sole contra-argument against this feature of DNICs is as follows. The investigations demonstrated that free iron incorporation into DNICs significantly attenuates Fenton's activity of iron ions [42,44].